I think I'm getting spoiled doing Quigley's themed puzzles thrice weekly over at his personal website. I now have ridiculously high expectations for his puzzles, which made this very good puzzle feel a little flat to me. I liked that there was a lot of stuff I didn't know (in answers and in clues) and thus had to fight for. I was less happy when the answers felt slightly made-up or stretched thin. Do people actually use the word DIGERATI (34D: Computer-savvy crowd), and if so, could you slap said people for me? I can't tell you how wrong the "E" in that word looks. I saw Spike Lee's "Inside Man," which is about a bank job, so I was very surprised to find out that the corresponding OUTSIDE MAN is not, say, a getaway driver, but a 52A: Gardener or landscaper. Knowing nothing of salamanders, and not having been old enough to attend nightclubs in the 80s, the whole SW was a bit of a surprise to me, specifically that "X" crossing where 35D: Salamander variety (axolotl) meets 43A: 1980s Big Apple nightclub with a chemical name. Seemed the only reasonable guess, but yikes. TIRO hurt a bit (25A: Newbie: Var.) ... and yet the intersecting "WE"s at 47A: Cry when you don't think you'll make it ("We're doomed!") and 47D: "_____ it!" (cry of accomplishment) ("We did") didn't bother me at all. Loved the well-disguised LARRY DAVID (58A: 1993 Emmy winner for "Seinfeld") and HIGH TREASON (4D: It has made many people lose their heads). With that last one, I had HIGH TRE---- and still couldn't fill it in. Ugh. In fact, the NW was supremely easy and done inside of a minute or so, but after I botched HIGH TREASON, things slowed down quite a bit. I also botched SETH LOW (19A: Early 20th-century New York City mayor), mainly because I'd never heard of him, so the "OW" part took a while to materialize. MATT DRUDGE (23A: Journalist with a widely read report) was, sadly, a gimme. He "reported" about how close the presidential election was in the final weeks (cherry-picking polls), causing much mockery from the folks over at FiveThirtyEight.com. Today's puzzle was packed with stuff I simply didn't know, and yet it was very solvable, which is exactly what a late-week themeless should be in terms of difficulty - hard, but ultimately fair. Just look at how much you can Not know and still solve the puzzle. 5A: City at the foot of Mount Entoto (Addis Ababa) - I got this because I knew that ADDIS ABABA was a real place on the earth, i.e. I guessed it from crosses. 7D: _____ el Beida (Casablanca, to its natives) (Dar) - I guess I should have guessed that. Instead, I took one look at the clue, passed, and never saw it again. 13D: Tritium output (beta ray) - understood neither clue nor answer, until I realized that BETARAY was not one word. Actually, my first thought was that there was some mistake, because BETRAY couldn't possibly be the answer to that clue. 44D: "Phoenissae" playwright (Seneca) - I know that SENECA was a playwright, I just didn't know he was responsible for this particular play. Let this be a lesson to all those who struggle mightily with the late-week puzzles. You can be one ignorant @#$#! and still take these things down. 16A: Sludge buildup sites (crank cases) - like that "Sludge" and "DRUDGE" are both in this puzzle. This answer makes me think of "Crankshaft," a comic I rarely read about a cranky (!) old bus driver. Here's one where Crankshaft ... has ... uh ... wow ... I hope he's not making that face because the woman's black. 39A: "The Emperor's Snuff-Box" novelist John Dickson _____ (Carr) - a gimme, not because I know this book in particular, but because John Dickson CARR was a prolific writer, very popular in the mid-20th century, and so very well represented in my enormous vintage paperback collection. 45A: Cliffside detritus (scree) - I Love this word. I learned it from crosswords, and I'm always happy to see it. So much cooler than SPREE. 36D: Classic Pontiac (Ventura) - I know this how? Old commercials? PPS HEY, SYNDICATED SOLVERS - if you live in the Southern California area (or anywhere close to it), check out the upcoming Crosswords Los Angeles Tournament! Agree that this was slightly obscure, but doable. 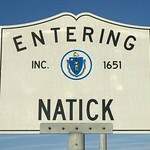 Took about 15 minutes, but had one bad letter from what I believe you call a Natick, i.e. a totally unfair cross, namely 35D and 49A. Could have been LTS or RTS. I incorrectly guessed right instead of left. Still a lot of fun. @rex: I agree wholeheartedly with your writeup. My biggest problem was I kept reading HIGH TREASON as HIGHT REASON ... which made no sense. Until AHA! My only guess was the "L" in LTS. But an "R" just didn't seem right, well, correct. Thought this to be a solid Friday puzzle, thanks BEQ! I agree, the cross of AXOLOTL and LTS seems unfair. RTS was just as legitimate and AXOROTL doesn't seem any sillier. RIPS ONE gets an entirely different clue in my mental reconstruction of the puzzle. Had SAG at 30A (be visibly despondent) only to find it was supposed to be at 44A. Being stereotypically male in that I have about an eight color palette, it never occurred to me that terra cotta would be considered any kind of orange. To me it is just brown. I'd have thought Gulf War should be capitalized. I've never used it but "digerati" is common enough that I got it off teh D and terminal I.
I didn't know all same things Rex didn't know, plus some more, like Drudge and Carr, yet still managed to finish correctly and without help, and in one sitting, at the end of a long day. Fridays and Saturdays are still iffy for me so big victory! Had groundsman for outside man, off the d and n, but gave it up quickly. I started the puzzle with ribeye and kit, finished the bottom first and worked my way up. Consequently, I had just the 'reason' of high treason, and tried to figure out what kind of *#^!ed-up reason would make someone lose their head. When I first started reading the clues, 'miasmas' popped into my head right away, but all I could think of for cross letters was 'taus' or 'chis' so I didn't write it in. I'm familiar with 'INRI' but it's been a long time since I've seen it used and I'd forgotten about it. Loved the puzzle, challenging, very satisfying solve with fun moments like 'kodak moments' and 'rips one' and 'we're doomed' as a few favourites. Yes, the 8-year-old in me quickly thought of a different clue for RIPSONE. I, too, noticed right away that this has a different feel than BEQ's self-published puzzles. Three sittings, 44 minutes total, two Googles, and one wrong letter. It was a fun ride though! I counted out the names of all four main actors in "Seinfeld" before getting to LARRY DAVID. The only 80s nightclubs I could think of initially were Studio 54 (which I've been to) and the Limelight (which I have not). Thought "journalist" was a bit of a stretch for MATT DRUDGE. I know AVISOS made SethG happy. @Cheryl: Congratulations! I get a real thrill when I can do that too (which is not often, but increasingly more frequently -- thanks to lots of practice and, of course, this blog). Thanks for the BEQ link! I'm definitely going to practice on his puzzles; I knew everything in this one, from wooly bear to axolotl, except the Vietnamese person - and I probably struggled harder with it than any of the rest of you. Need more. . . guile. Maybe just more brains, actually. Oh, and I liked the puzzle, too. It's fun to dredge up the likes of Seth Low from one's data mine. I agree with fpbear's Natick call on 35-Down & 49-Across. It wasn't just a guess between RT and LT. Also in play were OT (offensive tackle) DT (defensive tackle) and NT (nose tackle). They all fit the "Some linemen:Abbr" clue. In fact, since it was a Friday BEQ puzzle, I thought the more obscure options were more likely. Still a great Friday puzzle. Thanks Brendan. WERE DOOMED was my favorite clue. Now that was a struggle (I had to get up and walk away for a bit) but a lot of fun. I came up with a lot of answers that I didn't know I knew and I didn't google! I ended up with two errors - exolotl for axorotl - I was totally guessing. And Daba instead of Baba - I can never remember that for some reason. So for a tiro, that's pretty good. I am proud of myself, RR notwithstanding. My eyes moved the quote marks around "Report" to the first word in the clue: Isn't Drudge more of a "journalist" than a journalist? My first entry was RAJ and this allowed me to cherrypick in the North Atlantic region, first with KODAK then ASAJOKE. I guessed at RIBEYE and this gave me BETARAY which produced ADDISABABA and this helped break open the NE and got me MATTDRUDGE and entry into the NW. I worked in Flyover Country on a lot of short answers AVON SOB PAS (clever!) SERE and this got me HIGHTREASON and MOTH which helped me get MIASMAS and the NW fell. At this point I was 20 minutes in at the AVISOS JIF CARR line. I knew AVISOS from freshman year Spanish and got VENTURA to break into the SW. XENON was a neon for me because I was a big gossip fan during the 80s when we lived in the City and, along with Studio54, Xenon was in the papers alot as a celebrity hangout. I knew the lizard clue was going to give me trouble so I decided to work backwards from the Florida Keys and work towards 35D where I had AXO**** and no clue as to the answer. I had enough of the East Coast filled in to get most of the SE and ARMOIRE was the key. In the Oklahoma region I had a problem at 47 where I couldn't decide if it was an H or a W, both of which could work. SENECA/SAG broke the back of this puzzle getting me OUTSIDEMAN and MAV produced LARRYDAVID and the puzzle fell. As it turned out, I needed every cross to get AXOLOTL. I finally went with W at 47 because JAR turned out to be 38D. Since this was a BEQ puzzle, I was looking for some kind of high-tech clue and I wasn't disappointed at finding DIGERATI. I read a lot of of line journals and have encountered that word before. All in all, this was fairly simple to complete. I agree with Rex that doing BEQ's thrice-weekly themed puzzles held me in good stead with this one. At the risk of offending Allan, I don't consider Matt Drudge as any kind of journalist. I consider him an agent provocaeur with a fixed point of view which he goes to considerable lengths to support. Two clues I just don't get: "person in an apron" as ACTOR and "not overseas" as PAS. Anyone? As probably the only crossword-solving adult in America who has never watched Seinfeld, I found the southwest corner challenging, to say the least! Never having heard of that polysyllabic ESPN commentator nor being up on classification of lizards or vegetables, I declared BEQ as the winner in today's contest, and came to this blog for enlightenment. Thanks to Rex and everyone else for making even a failure-to-solve experience worthwhile. I have to say thanks to @Noam for the memory aid - Lett's do it - that's the kind of thing I learn here and never forget. And I guess I'll have to go back and try Elmore again since everyone disagreed with me. Maybe I'll see something new. @UltraVio--The apron of the stage is the part in front of the proscenium arch; PAS is French for "not." PAS is "Not overseas" because the clue really means "The word not as spoken in a certain European country north of Spain and west of Germany". An ACTOR is really a "Person on an apron", not in as clued. The front of a theater's stage closest to the audience, not covered by the curtains when closed, is called an "apron". I still have a problem with a person "in" an apron. Wouldn't the actor have to be embedded in the stage? I kept thinking that it couldn't be ACTOR because they would have to be "on" an apron. Had 18 minutes going, turned off the timer to check, didn't like PAS @ 27A crossing DAB @ 24D, stewed for 15 minutes between PUS/DUB and PAS/DAB without restarting the timer, and eventually figured out that "Not overseas" was PAS (Fr.) Still think that PAS is one of those words that doesn't translate into English that neatly, but because it is used only in negative constructions (and ballets etc., but that's a PAS of a different color) I guess it is OK. Certainly closer to the clue than PUS, which made no sense, although DUB sorta works for "Touch." AXOLOTL (35D): Remembered something from Ogden Nash, but had to look up the quote: "I've never met an axolotl, but Harvard has one in a bottle." Pulled BAO DAI (11D) from thin air, AVISOS (35A) was easy because of the Spanish signs here,* and must be headed back to age 8 myself because the same thought that TCBuell had occurred to me for RIPSONE (51A). All in all, a very satisfying solve, with everything basically fair and fun, but Thursday- appropriate challenging. *e.g. the sign posted bilingually in bars in Texas: "Warning: The unlicensed possession of firearms is a felony punishable by law by imprisonment not to exceed ten years...." Do other states need such signs or are we the final frontier? I guessed SETH LOW off the first name solely because the 15-year old Isaac Asimov went to SETH LOW Junior College, a Columbia University "we don't want Jews" campus from the early part of the 20th century. All these years, I never once wondered who the fellow was. It seems he was also President of Columbia University in addition to being mayor. I came upon some axolotls. A sight to make a man's blood freeze. they were orange, pink, and green, in the main. My hair stood up, my blood ran cold. I fled with fear upon my soul. Orange, I use woolly bears to clean pipes. And from now on I'm gonna use axolotls to, well, totally freak people the hell out. That is one awesome looking salamander, now my second favorite animal. (After giraffe, natch.) Lots of cool animals here. I think I've never been as surprised to hit 'Done!' on the applet and learn my puzzle was correct. I didn't know at least as much as Rex, and somehow this was my second-fastest Friday ever. (And if I hadn't held on to NAE for so long...). Also, did I mention The Pop Rocks are awesome, too? Sunday! I'm SOBbing, almost -- The top two-thirds was fairly easy. SE was no problem. Got nearly everything, but the SW did me in. Loved seeing "digirati" and MATT DRUDGE, a fantastic journalist. Drudge first reported the Clinton/Lewinsky story, and he's more accurate than most newspapers, whose print editions will soon disappear. It's great to see Drudge in the NYT puzzle while there's still an NYT. This puzzle is just too big for its britches - too over the top - for my tastes. There were some really interesting AHA moments, but, for me, they weren't enough to balance the many WTF moments. Learned it through crosswords? AXOLOTL, SETHLOW, DAR, BAO, XENON. i will not remember these words if i see them again tomorrow. Got them through googling. I generally love the BEQ puzzles, but, as Rex said, this one seemed a little flat. To me, it just didn’t have that trademark cleverness, brilliance even - rather, it seemed really obscure - and by that, I mean many of the crosses were obscure to me. The fact that I finished it at all was satisfying, I suppose, but I wouldn't describe the experience as fun - more like a relief when it was finished. Could be that it was just out of my wheelhouse - but really AXOLOTL? No smugness today. Good puzzle, but I'm getting used to the BEQ's not always passing the breakfast test. I think that's why this one seems flat...no bad-boy stuff in it. Alas. My husband uses the term Briar where I would say Hick so Tobacco Shop was Tobacco Road for a little while. I love the casual contemporary feel of a BEQ puzzle. I think I knew axolotl from high school biology. We might have dissected them but I hope not, they're kinda cute. I do remember cutting up some Texas-sized grasshoppers hoping to never see one in person that size. Regarding Elmore Leonard, maybe, maybe not. I just added my mixed opinion to yesterday. Rex and others just getting into comics: you really really wish to track down the Walter Simonson run on The Mighty Thor 337-382. One of the all-time greatest runs ever in comics. Here's the cover to #337, starring BETA RAY Bill. I got LARRY DAVID and TRIPLICATE and immediately got AXOLOTL straight up. Proud of that one. Good solid Friday for me. I was kind of expecting a joke answer for the clue that turned out to be HIGH TREASON and struggled mightily before getting it. Did anyone else have BURNT SIENA for TERRA COTTA? I feel like I was raiding the Pantone catalogue trying to visualise various shades. But strangely enough the common R and A in the two were enough to give me the NE. Speaking of the DIGERATI, I typed this whole comment on my iPhone sans caps lock. Anybody else here Twitter as they solve? I just discovered that Mrs. Rex calls Mr. Rex "Michael" !!! I must be the last reader to discover that "Rex" is apparently a nom-de-cruciverbalism... or is it a nod to his mastery of the realm? @DARYL - I had BURNTUMBER and then BURNTSIENA before finally getting TERRACOTTA. Its actually burnt sienna, though. I don't know how to twitter. I had burnt umber at first. NE was a chore, as i was very sure of RAJ, but coming up with 14D crossing the J took a while. Also had mignon for RIBEYE initially. ADDIS ABABA always makes me think of the first Superman movie, when Ned Beatty as Otis says "Are we going to Addis Ababa Mr. Luthor?". @jae -- that's one mad poem. Loved it. The ACTOR clue makes perfect sense so long as there is an open trap door in the apron of the stage and the actor is in that split-second process of falling through it. The BEQ crossword site (ref'd at RP's homepage) is really good. His puzzles (3x per week) are about this level of difficulty and he adds a couple of interesting/provocative paragraphs on a related topic. The cluing is not as button-downed as what we see today so perhaps the flatness (I didn't think it was) is because of the NYT style. E.g. I just did one with the clue "Fuc* birds", answered as SHAG. Brilliant, but I imagine Mr. Shortz would not be inking STET on that one. Had SINGLED (could also be DOUBLED, TRIPLED) not RIPSONE so the complete mismatch caused grief there. And the NE was mainly undoable until I googled the proper names. When I saw the mini debate on "journalist" vs. journalist (nicely done Orange, succinct and clever) I thought of Jeff Goldblum in The Big Chill ("I'm a reporter for People magazine.") Hey anyone that files reports is a reporter. Anyone with a journal is a journalist. Never heard of the DIGERATI, and I consider myself fairly tech-savvy. I actually thought it was something to do with Digg, and that it should have been spelled with two g's. All the info on the Wikipedia page for digerati refers to stuff that happened from '92-'96. @Alex, I had the same RTS/LTS problem. @SethG I love the obscure animal alphabet. Thanks! I just wrote up some notes on weird parasitic animal behavior here if you're interested. @Rex, the fozzy bear pic was awesome. I thought this was a great Friday puzzle. Even though I do BEQ's puzzles regularly I found this harder (and there fore better) than most. Because science/technology is 'my thing" I got AXOLOTL and DIGERATI immediately which opened up the entire bottom. I struggled with the NW and N Central for a while (despite having gotten TERRACOTTA) until realizing that CRANK was the beginning of CASE. I spent too long getting MATTDRUDGE since McLauglin was the only report I could remember this morning. Once HIGHTREASON fell (having just the E_SON made me struggle with the answer was some kind of PERSON) the rest of the puzzle came easily. This is the kind of Friday (and Saturday) puzzle that I love. Very few gimmes, a tough slog but ultimately doable with no Googles and no errors. And no WTFs when done! Found the NW really hard (I also had BURNT UMBER for a while) and finally had to Google for Addis Ababa. I think DIGERATI is journalese. I've never met a genuine tech person who used it, including me. I got AXOLOTL from the AX___ and remembering Ogden Nash from my childhood. This was really hard for me. Knew axolotl would be the word of the day. Never heard o f it and don't want a recipe for it either. I agree an actor in on an apron - chefs are in an apron. Can someone explain sop=offering of appeasement? 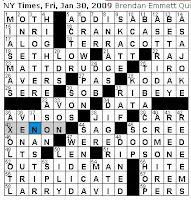 Most of what I would say already said: Very nice puzzle, seemed like Saturday to me, finished with no outside help, just one write-over: NAE/PAS. So here's a further reference to that Mad Magazine staple, (@chefbea, including a recipe) the axalotl. Filled in a few last night and a few more this morning. Stared at it and decided because of my solving capabilities I will rate this - not enough time in the world. Too much I didn't know so I decides to take a PAS. Off to make pizza sauces for the debut of the new wood burning brick oven. We will be having Superbowl Pizza Sunday. The 4 Square was a real puzzler. All those reasons to lose one's head. Tight, right, sight, eight, fight, light, might, night ... . I was favoring eight because of the dust mote, then realized the error of my ways by fixating on REASON. Addis Ababa and Ougadougou are my favorite African Capitals. Pretty tough Friday for me, but enjoyable. There were lots of unknowns to me, which is a little frustrating, but many beautiful words as well, such as astride, high treason, armoire and the clue and answer of 2d. I never heard or Larry David, but it is a clever clue. I ended up having to google 7D Dar, but that opened up the whole NW. Thought asparagus belonged in the dill family, the foliage is similar. @Wilson CPU: check out "Rex in the news" in the sidebar. Yo Jae: hit me up with an e-mail (link on my blog) and I'll send you my snail mail. Everyone else: thanks for the kind words. Mountain Entoto? Sounds Spanish to me. Let's see, what cities are there in Mexico? El Salvador? Guatamala? You know, the other country down there, Panama? Oh yeah Honduras. Let's see..
ORE_, vaguely Utah related? Must be OREN. Has to be. XENON isn't a chemical, it's an element. Can't possibly be right. HIGHTREASON? Can't be right. Seriously, MANY people loose their heads due to this? Maybe in the French Revolution, but over the course of history, MANY? Would love to have seen BEQs original clue for 46A. Inventor of the world's favorite pastime? I began the puzzle without noting who constructed it; it was slow-going. Finding MATT DRUDGE caused me to look up, shift gears, and dock with BEQ. Very nice. I agree with Rex that SCREE is a great word which I will probably remember because it is vividly linked to an image of someone delivering a "screed" in my head. Drudge gleefully posts items re the imminent demise of various newspapers. Probably hopes that his "Report" will prevail. I'm late today so I'll just copy and paste my comments from the ones above. No footnotes or citations; what do you think this is, a term paper? Just look at how much you can not know and still solve the puzzle. Slightly obscure, but doable. My only guess was the "L" in LTS. But an "R" just didn't seem right, well, correct. I think I've never been as surprised to hit 'Done!' on the applet and learn my puzzle was correct. You really really wish to track down the Walter Simonson run on The Mighty Thor 337-382. One of the all-time greatest runs ever in comics. this is a test. I hopefully changed my avatar so those of you coming to Wetsport a week from tomorrow will know to look for me wearing imsdave's xword puzzle. Hope to see lots of you there. Re: the puzzle - nice except the "what kind of tackle is it" - guessed correctly, but that's one tough cross. @Hazel and Two Ponies - right with you on the color missteps. Re: internet news sources - the scary thing to me is that much of our "internet" news is really sourced from newpapers - their decline is quite frightening to me. Unless there is a solution to the newspaper crisis, we will need a huge paradigm shift in our sources for information. Later than usual for me so I will just copy @crosscan's post. I thought, because of the thrice weekly solving (see Rex post)I would sail through this one in a JIF but me and my VENTURA CRANKCASES WEREDOOMED. I have no SKREE to add. I love the AXOLOTL and was very happy to remember the cross letters with but a twinge to my strange 666 birthmark. SOB off to happy hour. Very tough Friday for me, but that's what they should be. Over an hour, 3 sittings, and 3 googles. I felt a lot better reading PuzzleGirl's post. The amazing thing is that I had the entire south done in about 15 minutes (one error: had ben for len). But the north killed me! Hated actor for all the same reasons above. BTW, my first answer was carr, my favorite mystery writer of all times. I like him better that EQ because I think he was more prolific (he also wrote under the name Carter Dickson). Wish, like Rex, that I had kept his paperbacks. They are worth rereading. Got jif in a jif because that's my PB of choice. @edithb: "you talkin' to me?" (Was going to link to De Niro in Taxi Driver, but I watched the clip. It's WAY too harsh for my intentions.) :>) Were you afraid of offending me because you think I like Matt Drudge, or because you think I'm "an agent provocaeur (sic) with a fixed point of view which he goes to considerable lengths to support."? So psyched to have axolotl show up in a xword. This was an old friend of mine's favorite word so I knew it right off. Made the whole SW a piece of cake. My big problem was never getting terra cotta. I had "kido" instead of "tiro" (wtf is tiro??) assuming the misspelling was ok because of "Var." ..rrgh. This made 13D "ten a day", which seemed like a reasonable "output" to me. Oh well. Just finishing a Friday with no looking up is hella good for me. All those Aztec words Tlaloc, Tezcatlipoca, Huitzilopochtli and Quetzcoatl - not an R in sight. I thought I would be on safe ground going with LTS crossing the word AXOLOTL. The last time Quetzcoatl showed up in a puzzle I checked it out. When I saw 35D ended in TL, I assumed there was no R in the word. Whew...looking at follow-ups, couldn't find my image...only to find that I'm mikeguida1 at the moment. That's what i get for logging into google with the husband's name. that does not recoil from suntan oil or the gurgle of Coca-Cola"
If you drew a line down between 8D and 9D everything to the right of this puzzle was blank for me, with the exception of RIBEYE which I thought might be wrong. Maybe this one was rejected from BEQ's site as being too tame so wound up at the NY Times! I'm not surprised given your infatuation with BEQ that the WE crossing didn't bother you, but ending it on PERS? oh well, I guess that would AXOLOTL of a pers to have it perfect. Sop for appeasement just goes to the meaning of the word. Check the dictionary. There was a lot I didn't know in this puzzle but that was one I got! @crosscan: that was so weird reading my words in your comment. Talk about deja vu. Back to BEQ. Of course this puzzle being in the NYT couldn't contain racy clues with answers like WHO FARTED wasn't it? (GASP!) was the clue. Forgive me for not going back to check. Anyway, I think he's great on his site and great in the NYT when he has to soften his approach. I don't think it's flat. It's just more diSCREET. I was just checking my recollection of radioactive decay and my dictionary said that the loss of a BETA particle (essentially an electron or positron) would change the atomic number of the decaying element. This seems fundamentally wrong, but having just recently made a physics faux pas, I thought I might seek confirmation before averring the case. I was going along quickly without noticing it was a BEQ puzzle. "That's surprising" [my speed], I thought but kept filling in letters. But then I came to the NE and a complete stop. I just didn't see Addis Ababa (I kept trying to think of Japanese cities) and even after googling it, had to google a couple of more times before finishing. The singularity of the DATA Clue, was a BEQ/WS affront to pettifoggers, was it not? I just buzzed through the puzzle this morning, and didn't get a chance to consider a critique till much later. That SHAG story reminded me of the Naughty Puzzles available at your local bookstore. DIGERATI is indeed journalese, but the term is a bit long in the tooth. As are memories of XENON, which was located in a former theater near Times Square. Next up: PALLADIUM, AREA, LIMELIGHT ?? I've been having so many typos lately . . . I misspelled QUETZALCOATL three times(! )in my last post. You would think there is no preview button available. @acme: you are absolutely right. The we-we cross is not pretty, and the pers ending isn't either. Good for you, keep us honest. I think "Axolotl" is a short story by Lorca, and I think I read it once. Maybe not. I had TRIPLICATE and LARRYDAVID so I was able to get that section, as well as the NW. I didn't have too much to go on in the NE and couldn't get that area. Like anon 2:34 I thought Entoto would be in another part of the world. Unlike @alex I thought terra cotta was just plain old orange. I also had NAE for PAS. I see you can solve a puzzle without knowing &)*$, but if you THINK you know something, and are wrong... DOOM. 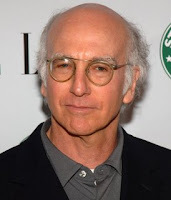 Talking about keeping it real, with no pretty ends, since you don't know who Larry David is, watch some episodes of "Curb Your Enthusiasm"...I'd be curious what you think. This puzzle was great--did it at one sitting, challenging, but no googling was needed, clues that made sense. Whoever suggested just looking at a clue and thinking about it was right, just thinking until one gets it. Enjoyable clues and answers but am stunned that digerati is an actual word. Got it but thought it was a play on similar words. More Friday puzzles like this would be excellent. @fergus: the loss (or gain) of an electron would change the valency of the atom, not the atomic number (the number of protons in the nucleus) so your dictionary is wrong. If you lose a neutron you get a different isotope (deuterium in this case). If you lose a proton you have a different element, but tritium is an isotope of hydrogen and thus only has one proton to start with. So here we are, post-ACPT, and I'm just getting to this puzzle today out in syndication land. Axolotl makes a triumphant return, or preappearance, depending on your timing. And there's that infamous and often mentioned SKATE clue that wound up again in puzzle 8 at the tourney that helped to undo the A solvers. This was a bit of a bear of a puzzle and although it was not unsolvable, I didn't like it much. DAR, BAO, SETHLOW? Huh? OUTSIDEMAN seems contrived to me. But I love love love that XENON was there, one of my favorite elements and the name of one of my online personae. Also being from Rochester, I appreciated the shoutout to KODAK. I can imagine people losing their heads for the RIGHT REASON. But then what's a MOTR? Whoops!